A “multi-talented” man can fly high and raise a giant pumpkin at the same time. A commercial pilot from Oregon was able to raise a huge pumpkin weighing 2,170 pounds or 984 kilograms to emerge victorious in the pumpkin-weighing contest in Northern California. Steve Daletas credited his win on Monday to the factors of a good seed and the blessing of lots of sunny days since he planted the pumpkin on April 15. He planted it with the hope of winning the 45th World Championship Pumpkin Weigh-Off in Half-Moon Bay, California. His wish was granted. So huge was Daletas’ pumpkin that he had to use a backhoe to place it on a pickup truck. He had to drive for 12 hours to bring his entry to California. Daletas is no stranger to winning the Pumpkin Weigh-Off contest as this marks the fourth time already that he comes home with the top prize. For this current victory, the pilot from Pleasant Hill won $15,190 for the lumpy pumpkin. The winning pumpkin will be showcased at Half Moon Bay Art & Pumpkin Festival this weekend. The world record for the largest pumpkin was set in 2014 weigh-off in Germany by Swiss farmer Beni Meier. 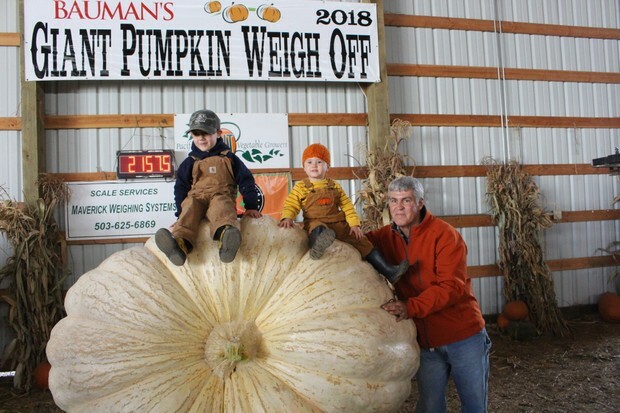 Meier then grew a 2,323-pound pumpkin or 1,053 kilograms.